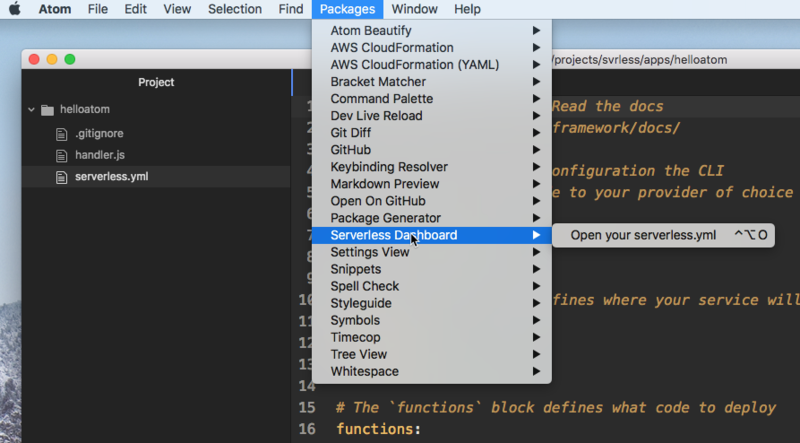 Many developers love and use the Serverless Framework for writing their serverless applications. 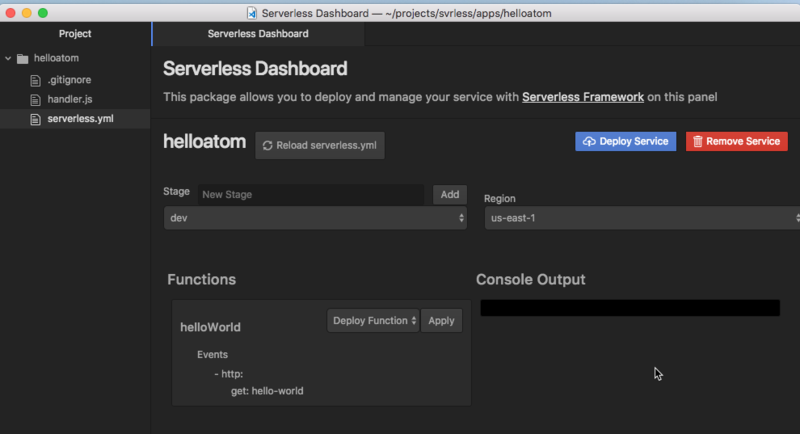 In the spirit of making it even easier to manage the serverless applications using the Serverless Framework, Takahiro Horike, created the Serverless Dashboard package for the Atom editor. 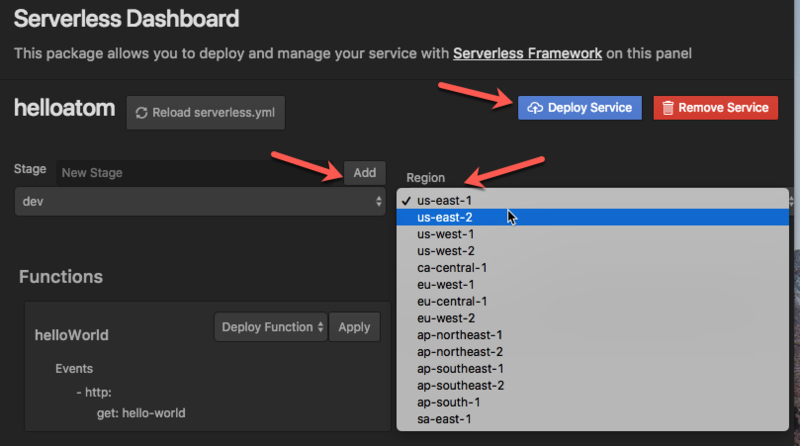 In this post, I will give you an overview of the Serverless Dashboard package. Let's start by installing the Atom package or plugin. If you don't have Atom, you'll need that first! 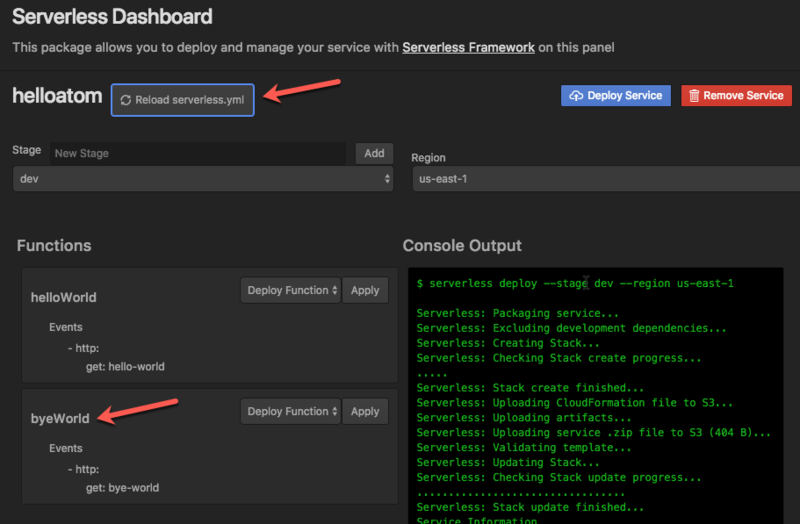 If you don't have the Serverless Framework installed, you'll need that too. Let's create a simple app named helloatom using the boilerplate template provided by the Serverless Framework. Open the app files in atom. 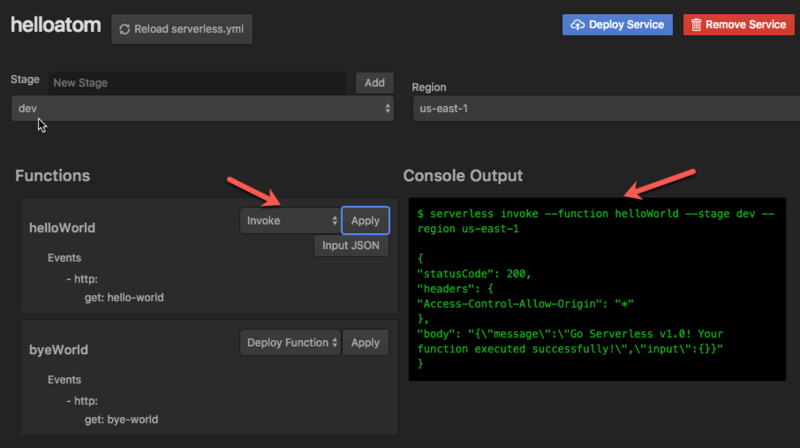 Click on the 'Open your serverless.yml' and choose the serverless.yml for the project. 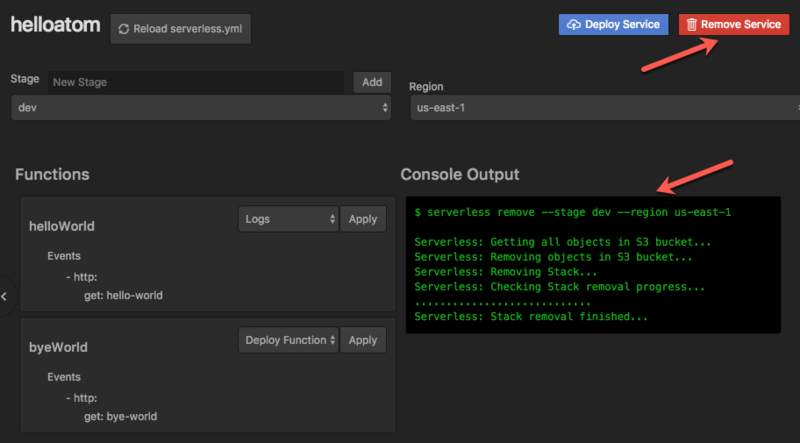 A new pane will open with the Serverless Dashboard showing a visual representation of the serverless.yml file. 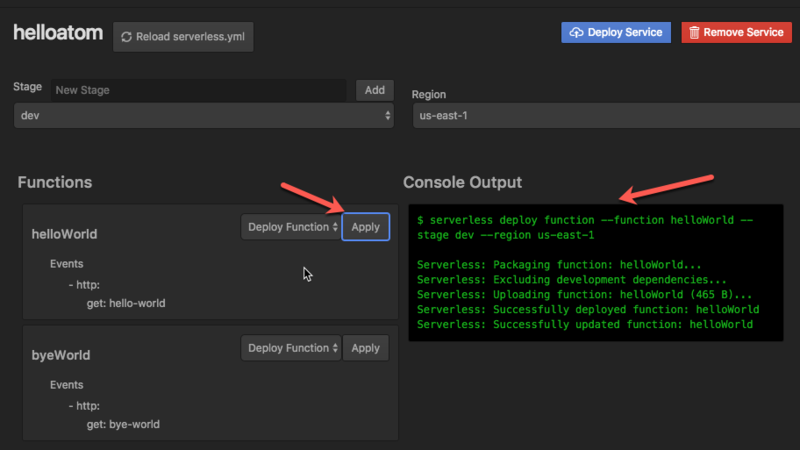 The Serverless Dashboard plugin not only lets you visualize the serverless.yml file, but also helps you easily manage a few things inside the Atom editor pane. You can easily deploy the service by clicking on the 'Deploy Service' button. The service will be deployed to the stage and the region as specified. Note that you can change those settings directly from the pane. Nothing new here if you're already familiar with Serverless Framework. The output of the deployment is exactly what you would see in the terminal if you'd deployed using sls deploy. 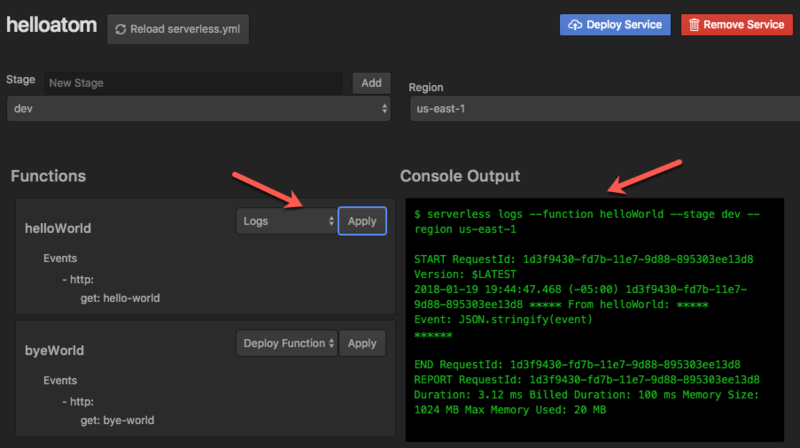 Switch over to the Serverless Dashboard pane, and click on the 'Reload serverless.yml' button. Let's deploy the service by clicking on the 'Deploy Service' button. Let's update some code in our functions. We will just add a simple line to log the event object that we receive. 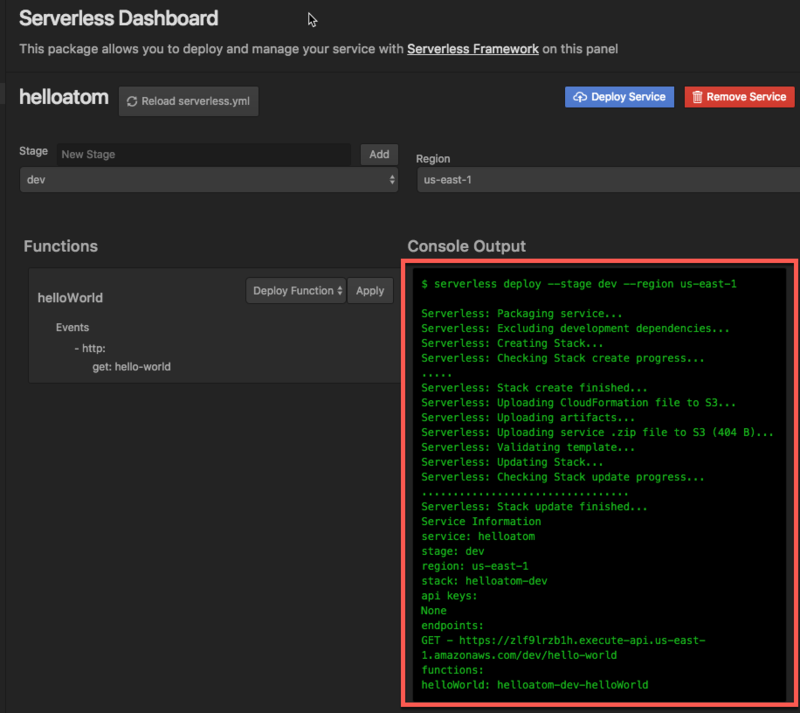 The Serverless Dashboard is a convenient package that you can install in Atom to easily access various commands for the Serverless Framework within the Atom editor. It does not support all the commands that are available via the CLI, but it covers the most commonly used commands for managing a service. Kudos to the Serverless Champion, Takahiro Horike, for writing this package and helping the community. A wish list for bringing databases up to speed in the era of serverless application development.